It can be a challenge to find equipment manufacturers that keep all their production here in the US. A lot of the small US companies fly just under the radar, missing all the press, and are often found only through word of mouth. Once you find a Made in USA company the challenge then becomes deciphering what’s only assembled in the US from what’s sourced and completely fabricated in the US. Enter Brandon, the owner of V Line Climbing. With an extremely good eye for design, Brandon has been making custom bouldering pads in the US since 2008. He is a prime example of how easy it is to get stoked on small-scale American manufacturing. Located in an industrial area of downtown Salt Lake City, Brandon shares a warehouse with a fellow small business owner. In August 2013, V Line’s operations were utilizing a quarter of the shop space. Five months later Brandon had commandeered more than half the shop. As V Line grows Brandon never forgets his humble beginnings: In 2007, he had a hunch he could make higher quality bouldering pads than what the majority of the market was offering. He sold his car to buy his first industrial sewing machine and then sold his motorcycle for fabric used to prototype his designs. It turns out that a new industrial sewing machine will cost between $1600 and $6000, depending on their specific function. Shortly after getting started, V Line’s production experienced a setback in 2008 after a major BASE jumping accident. Fortunately, sewing helped rehab Brandon’s ankles and kept him busy while he recovered. Thanks to years of patience Brandon’s commitment and thriftiness has paid off and he’s now going strong with 9 industrial sewing machines surrounding an enormous white layout table in his shop. All the machines are prepped for different functions or with different color thread for stitching, as V Line pads are made to order with custom colors. In fact, all the chalk bags, chalk pots, and urban bags he sells are, too. V Line custom color chalk pots: white is heading to Colorado and red to Pennsylvania. 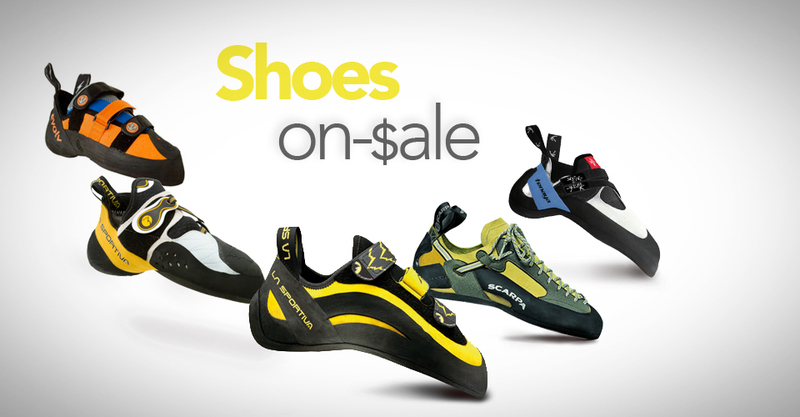 Almost every climbing company says quality is their highest priority. But there’s always a balance between the margins and the value they’re brining. It could be the highest quality product for a certain price. Or the highest quality in a particular area. Or just high quality in the fact that the goods are guaranteed to not randomly break. For V Line, quality mean’s sourcing the highest ranking materials possible for every piece of the product. Brandon’s stance is unwavering in this matter and that makes a lot of business decisions easy; he only orders from the top shelf. 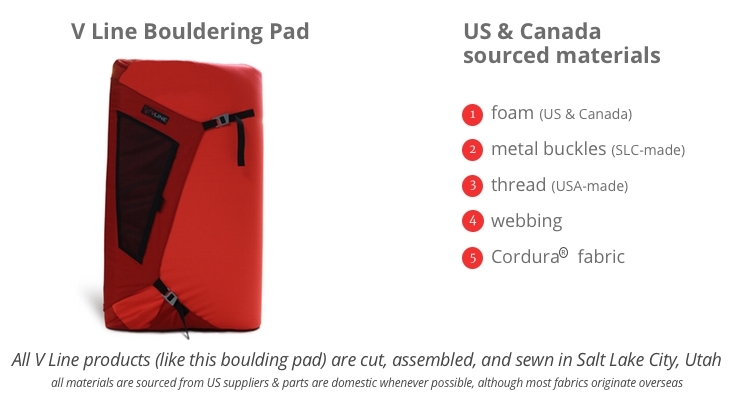 Case and point: Brandon only uses certified Cordura(R) for his top and bottom cover sheets on all his bouldering pads. What does this mean? Fabrics that use the Cordura(R) brand name have been tested and approved via the most rigorous testing process in the industry. In fact, many US military fabric specs are based on Cordura(R) brand specifications. And only the highest-end luggage companies use Cordura(R) fabric to handle the abuse of travel. Brandon explains that he uses Cordura(R) because it is guaranteed high quality. V Line pads have a 1050D Ballistic Nylon bottom sheet and (depending on the pad) usually a 1000D Nylon topsheet. These fabrics are both Cordura(R). The difference between Cordura(R) fabric and uncertified fabrics is clear only when you compare multiple samples that are all named 1000D Nylon. Brandon had samples that were sent to him from offshore manufactures in futile attempts to entice him to move production offshore. Although the samples are labeled 1000D Nylon when you feel the fabric it folds around your fingers and has a flimsy quality. When you touch Brandon’s 1000D Nylon that bears the Cordura(R) label, your fingers rub against the stiff fabric, it feels burly, and is noticeably thicker. Without an official certification there is no guarantee that the fabric meets incredibly high standards. I have offshore companies approach me at tradeshows trying to get me to move production overseas to their factories. They say they can have the entire pad assembled and shipped to me for less than the price I pay for materials. Similarly, it is impossible to say that all closed cell foams and open cell foams are created equal. Foam is rated with a lb (pound) density and a hardness ILD (Indentation Load Deflection–which is how fast it bounces back). These numbers vary greatly in range, and is why 3″ of open cell foam on one pad may feel drastically different from 3″ of open cell foam on another. Unfortunately, there are no manufacturers that display this information on their website’s technical specifications. The balance for the manufacturer is to get the right density and hardness so falls are soft and smooth (while ensuring you’ll never bottom out) and to create a substantial longevity to the pad as well. Cost is certainly a major deciding factor in finding the right balance, for most companies. Brandon knows higher density and hardness correlate directly to a higher cost but that does not persuade his design decisions in finding the best foam for the job. Brandon has strong relationships with his foam companies and sources his foam entirely from the US and Canada as he strives to source everything domestically. On V Line’s bouldering pads, the open and closed cell foams are so dense that when you first get your pad you’ll be surprised how challenging it is to fold it into the taco shape–his foam has a lot of body to it–yet it’ll still catch your fall comfortably. The story continues with thread. To ensure high-quality you need to know everything about your supplier. One of the common issues with thread made offshore relates to the dyes that tend to have higher amounts of acid, which increases the likelihood that the threads will break down quicker. Brandon is excited to report that the US manufacturer he uses has the highest quality thread around. When you look at V Line’s loaner pad that has been put through the ringer for the last 8 years you won’t find a loose seam anywhere. Brandon also mills the metal buckles (seen on his pads and bags) himself, at a friend’s machine shop right in SLC. Amazingly, Brandon’s pads are priced competitively (see V Line’s website for current pricing) even though all the materials are sourced through US companies and are manufactured domestically (when possible) and assembled in Salt Lake City. And to please the customer, Brandon merrily accepts and actively encourages custom color orders for all his products. These colors come at no additional cost. In the past, one customer even sent in their old Louis Vuitton handbag that Brandon stitched into a chalk bag. Follow v_line_ on instragram to see photos of his custom products. If Brandon (or Natalie or Gloria or Adrian, his hard working seamstresses) are racing the clock and all the parts are perfectly gathered, it takes 10-12 minutes to make a chalk bag. These chalk bags sell for $22. It’s not an easy road for the American manufacturer. Since Brandon started V Line, the price of high-quality foam has doubled. Even so, sourcing foam from companies in the US and Canada remains an unwavering priority. It’s funny, although the US orders keep him busy, the orders coming from Japan keep him busier. It turns out the Japanese market really values high-end, 100% Made in the USA goods. This demand allows Brandon to keep creative as he designs new styles for the market. He’s expanding his bag line for more crag and urban packs and is about to come out with a hinge-style highball bouldering pad. It’s invigorating to see Brandon’s hard work. It’s easy to be inspired by his passion for design and dedication to US manufacturing. When we asked Brandon if we could switch out the WeighMyRack trailer’s futon-like couch-bed for a custom built bouldering pad he quickly agreed, always up for a challenge. Now, we just have to get back to him with dimensions and custom colors. As the saying goes, you can achieve anything you want to as long as you’re dedicated. Brandon is dedicated to keeping the American manufacturing dream alive; the dream of creating products that clearly stand apart from the crowd in quality and lifespan; the dream we should all want to support because we know the company history and feel compelled to be part of it. This Alter Ego bouldering pad was made for a 5.10 rep from Rhode Island, who boulders in an area abound with hunters. He requested a pad that would let others know he wasn’t a bear. The super-bright hunter orange was too bright for the camera to fully capture. All photos in this post taken by WeighMyRack.